This is the time of year where we begin to really focus and think about the things that we are grateful for. Sometimes we don’t even think about what we are thankful for until its actually thanksgiving day. 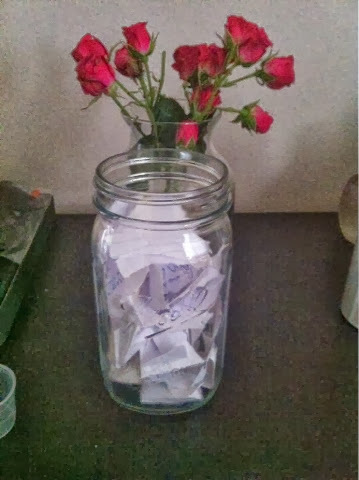 I actually got the idea of this thankful jar about a year ago when I saw it on Pinterest. You are supposed to fill it up throughout the year with things that you a are thankful for and ten read them December 31st. Well, I had the best intentions to start this jar but it never happens until recently when I though about it again. I told my hubby “lets go ahead an start this jar ebb thought the year is almost over. 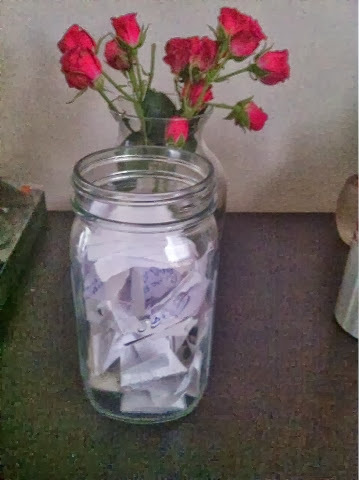 So we sat down and began to think about all of the wonderful things that have happened this year, wrote them down and then placed them in the jar. Out faces lit up as our nostalgia took us to found memories throughout the year. There was one memory that I wrote down that started out found but ended in tragedy and that was the miscarriage that I had not to long ago. When kent and I found out that we were pregnant we were scared and ecstatic all at the same time! When the miscarriage happened it was devastating. We both cried a lot, but as I was reminiscing I began to be thankful for the fact that I was able to get pregnant and the hope that when the time is right, it would happen again. Thankfulness really does make a difference in your state of being. When you focus on the good in your life it’s hard to concentrate on the negative. So my fiends it’s never too late to start a thankful jar. What are you thankful for today?